Controversy trailed and was never far from the well-known Silver Age poet and rival to Mayakovsky through his life. "My Russia, wooden Russia! 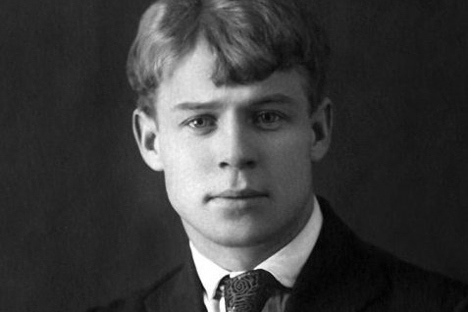 I am your only singer and herald"
Sergei Yesenin was born in the Ryazan region’s Konstantinovo village on October 3, 1895. From the window of his home he could see a church and the hilly banks of the Oka River, all of which he would recall in his poems. He began writing poetry as a child and, when he left school, he moved to Moscow to conquer the literary world there. His first poems were published in Moscow. Restlessly, in search of fame, Yesenin moved to St. Petersburg, where he became a well-known figure at literary salons, wearing traditional clothing; bast shoes or felt boots, with sheets of his poems wrapped in a rural headscarf. The canny self-promotion in an era well before the advent of the PR industry worked brilliantly, and the self-taught village poet, with a mop of golden curls, became incredibly popular. In 1916, he got the opportunity to perform before the family of Tsar Nicholas II. "Infamy has come to me, / That I am an abuser and scandalmonger"
Yesenin earned considerable notoriety as a troublemaker. Immersed in the national literary scene, he often teased other poets. His best-known literary duels were with another famous poet of the era, often considered his literary rival, Vladimir Mayakovsky. With his love for the rural space, Yesenin did not accept his counterpart's revolutionary and industrial poems. Mayakovsky, however, urged him not to waste his talent describing nature and dedicate his works instead to Bolshevism. During a public reading of his poetry, Yesenin told Mayakovsky he would not give “his” Russia to him: "Russia is mine! And you are an American!" To that, Mayakovsky replied sarcastically: "Take it, here you are! Eat it with bread!" "Many women loved me, and I loved more than one, too"
Love is the other major theme in Yesenin’s work. Quite the handsome ladies’ man, the poet had four children from various alliances and affairs. His first common-law wife, Anna, gave birth to a son, Yuri, in 1914, but Yesenin left his family and moved to St. Petersburg, rarely visiting the child. Yesenin’s second ‘official’ wife was the American dancer Isadora Duncan. She was 18 years older than him and neither spoke the other’s language. Their scandal-filled marriage lasted about two years. The poet accompanied Duncan on tour through Europe and America, where he would perform at parallel literary events. Sofya, Yesenin's third wife, was Leo Tolstoy’s granddaughter. The poet married her a few months before his death, and this was also an unhappy marriage. "Everything here is too filled with the 'great old man,' it is choking me," Yesenin complained while living in Sofya’s home. It is Tolstaya who did a lot to preserve his legacy and left memoirs about him. "Silly heart, don't beat ..."
Yesenin greeted the 1917 Revolution with enthusiasm and the hope that Russia would be transformed, but he soon saw the hunger, destruction and terror in the country, and began describing apocalyptic scenes: "the garden of skulls" and "rabid glow of corpses." In his long poem Pugachev – about the famous rebel and impostor who organized a mass revolt against Catherine II – Yesenin turns to the theme of confrontation between power and the people. The Land of Scoundrels, another long poem, would continue this theme. In 1924, a year before his death, in the poem The Return Home, he describes a ravaged village with its poor wooden houses and a calendar portrait of Lenin hanging instead of an icon. Seeing Yesenin as an ideological and cultural danger, the authorities harassed the poet, bringing arbitrary court cases against him. In 1925, nervous breakdowns, alcoholism and pressure from the authorities landed Yesenin in a mental hospital. A month later he was found hanging from a pipe in the Angleterre Hotel in Leningrad (as St. Petersburg was known in the Soviet Union). The previous day, Yesenin had composed his final poem, Goodbye, my Friend, Goodbye, in blood.